(News.com.au 08 January 2014) He may be in the country to celebrate his dictator best mate’s birthday today, but Dennis Rodman is making headlines for entirely different reasons. The former NBA star, currently in the isolated state to celebrate Kim Jung-un’s birthday as part of a basketball tour, lost it during an interview with CNN’s Chris Cuomo. The eccentric Rodman lashed out at the CNN anchorman who quizzed him about visiting North Korea so soon after the execution of Kim’s uncle. “I don’t give a rat’s a*** what the hell you think,” he said. “Look at the guys right here. Rodman has been protective of his relationship with Kim after striking up a friendship since meeting a year ago. But their relationship isn’t as bizarre as the rest of the world might think. According to one expert, the pair have a mutually beneficial relationship with Kim using Rodman as a PR weapon against the west and the American using his new found friendship to become a celebrity once again. Dr Leonid Petrov, researcher at Australian National University’s School of Culture, History and Language, told news.com.au while North Korea seems a strange country, its leader’s friendship with a former sports star was far from odd. Dr Petrov said the dictator’s attraction to someone like Rodman wasn’t unusual when you considered Kim’s lifelong obsession with sports and basketball in particular. Kim, who was educated in Switzerland, is a keen basketball fan and loves the Chicago Bulls. Rodman played a key role in winning three NBA titles for the Bulls alongside Michael Jordan in the 1990s. According to Dr Petrov, Rodman helped Kim show his people and the rest of the world the Supreme Leader had the human touch and that a friendship with a basketball icon would be a dream come true for him. “Kim has always had a strong interest in sport from a very young age and Rodman is an idol to him,” he said. Dr Petrov added that with North Korea being isolated from the west, Kim “feels he needs some form of appreciation from the world” and such a relationship brought some normality to the country and its people. “Both (men) want the attention, Kim gets attention from the western media and so does Rodman” Dr Petrov said. 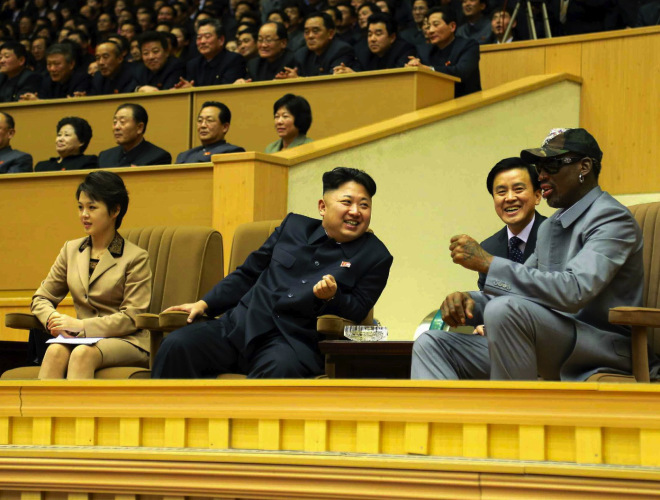 Rodman first struck up a bond with the Supreme Leader in February last year when he visited the country for what was coined a “basketball diplomacy mission” where he attended a mixed-match basketball game with VICE Magazine . Kim Jong-un reportedly declared Rodman, known as “The Worm”, a “friend for life” and the sportsman is one of the few Westerners to have met him. WHY IS HE BACK IN NORTH KOREA? The ex-Chicago Bulls player is leading a team including retired NBA All-Stars Kenny Anderson, Cliff Robinson and Vin Baker for a celebratory exhibition game against North Korea in honour of Kim’s 31st birthday. Dr Petrov said while Rodman had clearly failed when it came to bringing up human rights abuses in the rogue state, at least he was extending the hand of friendship in the spirit of reconciliation. One positive aspect of Rodman’s visit was it did open up some diplomacy with the world and at least allowed North Koreans insight into the west and an opportunity to learn more about the world. However Dr Petrov said the former NBA star had missed an opportunity to talk to his friend about human rights, its collapsed economy and an illicit drug and black market trade. Speaking from Beijing Airport ahead of the visit, Rodman said he hoped the match could “open the doors” to “talk about certain things” and said he wasn’t there for a political debate. “But I am not going to sit there and go, ‘Hey guy, you are doing the wrong thing. That is not the right way to do it.’ He is my friend first … and I love him,” Rodman said. According to Dr Petrov, it’s not only a missed opportunity to help the people of North Korea but loses him respect with the west.